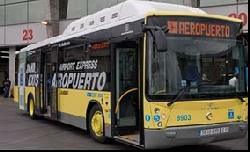 The Madrid airport bus service direct to Madrids city center train station at Atocha started operations at the end of November 2010. The 24hr service is now a cost competitive alternative to the Madrid Metro and almost as quick as the Madrid Taxis, where the bus cannot compete is with the "exclusivity" of a private transfer. The service is operated by specially adapted buses that allow for disabled access and are internally configured with racks for transport of luggage. Operating 24hrs the Madrid airport bus has slightly longer journey times during the day at 30 minutes compared to at night when less traffic sees the trip in either direction take no more than 20 minutes. Be aware that in "rush hours", 0730 - 0930 and again at 1630 - 1930, the journey time can be longer. At just 2€ in each direction the Madrid airport bus costs exactly the same as the Metro. Inside Madrids Barajas airport the bus serves the lower arrivals areas at Terminal 4 and Terminal 2 with passengers arriving at terminals 1 and 3 having a short, covered and inside walk to the stop at Terminal 2 (approx 7 minute walk with baggage). Atocha train station (Train, Metro and Cercanias services). Bus station Menendez Alvaro / Estacion del sur - Airport bus to O Donnell then Metro should see a total journey time of approx 45 minutes. Sol / Gran Via - Bus to Ciebeles then a short walk of approx 300 meters to Metro Banco de España or Walking direct to Sol 10 minutes, Gran Via 7 minutes (This is to the begining of Gran Via, which is a very long street, therefore compare your destination / address with the metro stop). Art Triangle (Prado, Reina Sofia & Thyssen) - From Ciebeles these are approx 10 minutes walking. Chamartin train station / Cercanias - The Cercanias station of Recoletes is around 300 meters from Ciebeles and offers direct train services throughout the Community of Madrid area (state / county of Madrid).